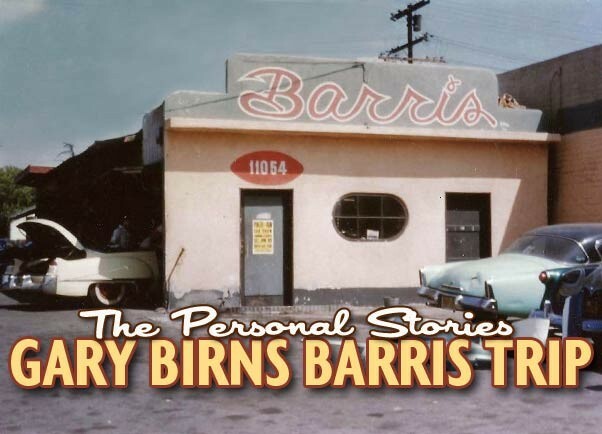 In the summer of 1960 Gary Birns and two friends make a Dream trip from Cleveland, Ohio to the Barris Kustom City Shop in Lynwood California. 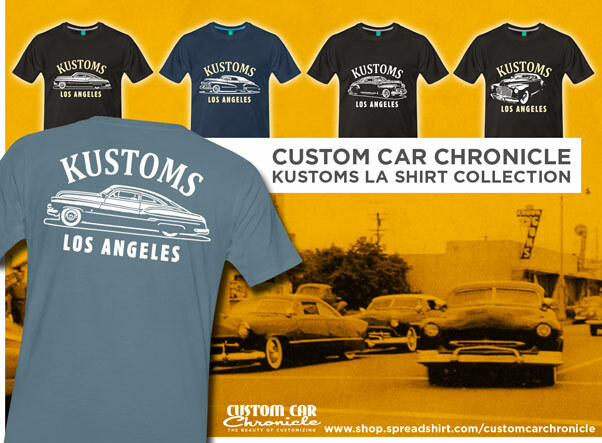 Back in the late 1950’s early 1960’s Gary Birns was a 18 year old high School senior, and just as most of his friend he loved Kustom Cars. The guys would get all the little Custom Car magazines they could get their hand on and dream about all those beautiful customs inside. 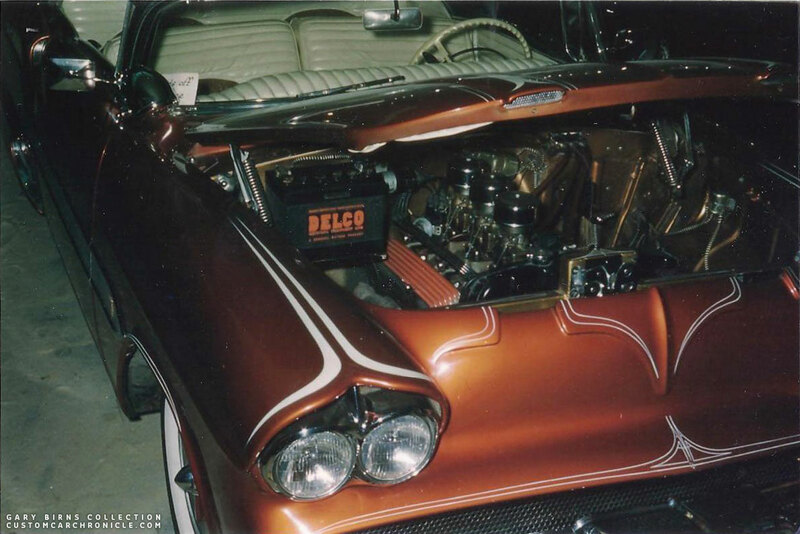 In their spare time they were creating their own custom cars in their home garages and if there was enough money saved from doing spare time jobs, they would have some more serious work done at the local body shops. The guys noticed that a lot of the customs featured in the magazines came from California. 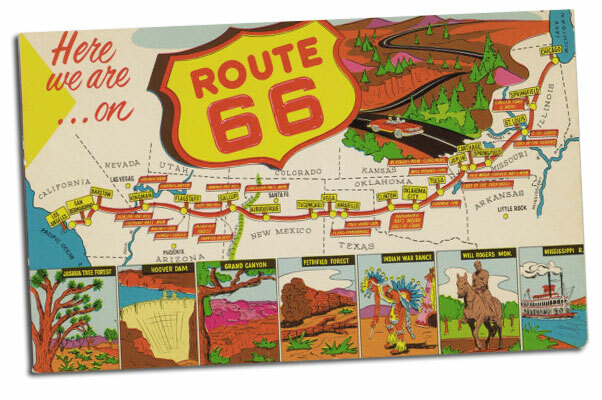 In early 1960 a plan was made to go to use the summer vacation that year to go on a road trip to California. 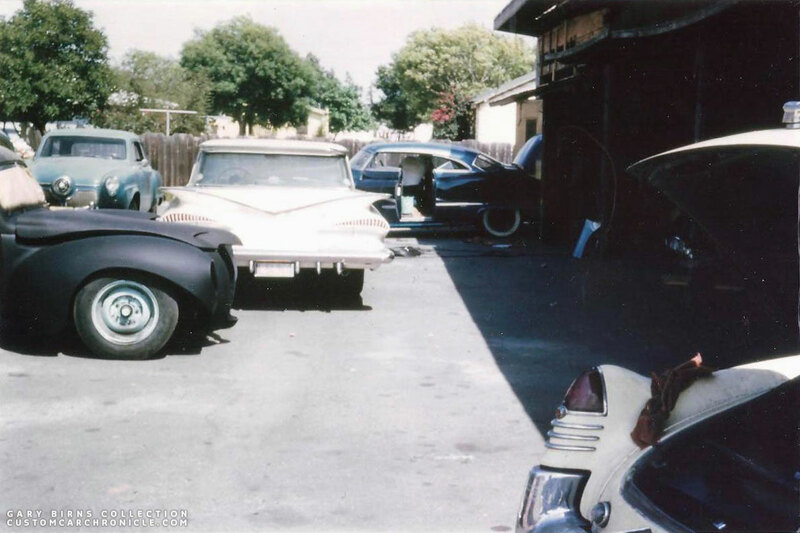 The main goal for the trip was to visit the Barris Kustom Shop, because the Barris Kustoms name was something that could be found in all those magazines… that must be the place to be. 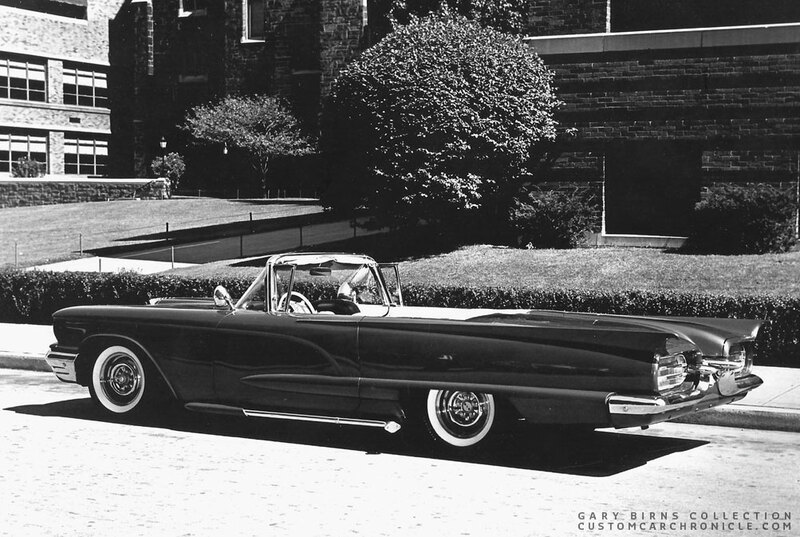 At the time Gary was the proud owner of a 1959 Thunderbird convertible that was nosed, decked & Scalloped. 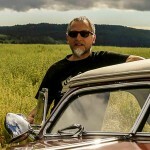 Gary was hoping to come back from the trip with ideas that would turn his car into California styled Kustom. Gary and two of his friends decided to actually make the trip and they left Cleveland, Ohio and drove to Chicago where they took route 66 straight to Los Angles, California. They would name it the “yellow brick road to Barris”. On their way they did some sight seeing and it took them about a week to get there. They all took turns driving and they slept in the car when we weren’t driving. They also stayed in a few motels during their trip which would take three weeks. Gary, being from Ohio expected he would see a lot of Custom cars on the streets in California. He did see more Custom cars in Southern California than in Cleveland, but nothing too radical like he had seen in the magazines for the past couple of years. Although the closer they got to Los Angeles, the better it got. When they arrived in Los Angeles more and more mild customs could be found driving the streets. 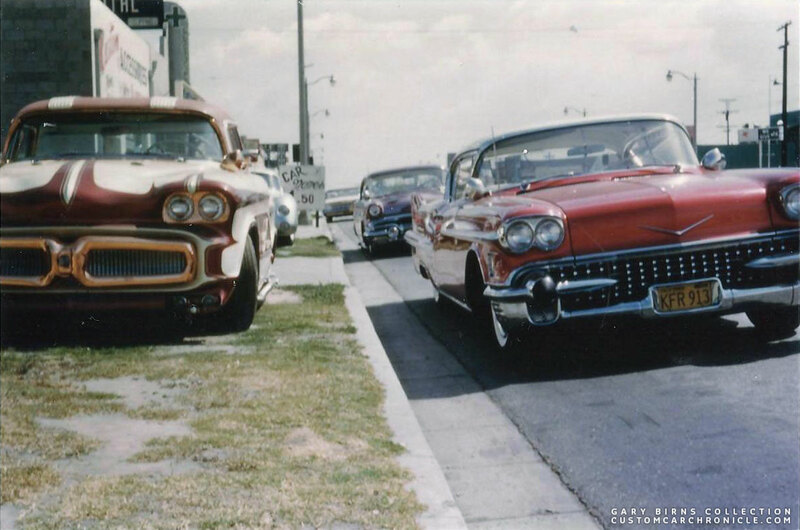 When the guys saw the signs for Lynwood they started to get nervous, because this was the city that Barris Kustom was in. When they got to S. Atlantic Blvd. Gary started to sweat big time. 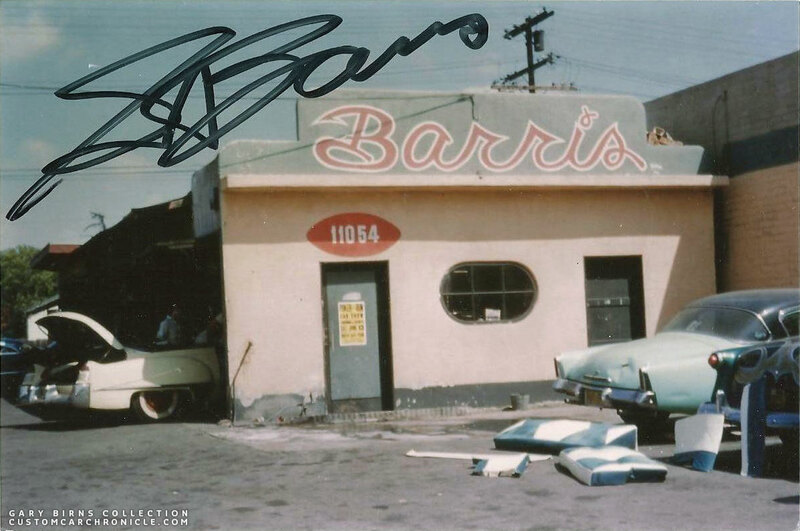 And there it was… 11054 S. Atlantic Blvd, Gary’s “Dream” came true he was in front of Barris Kustom Shop! Gary couldn’t believe his eyes, there were Kustom Cars all over the place, parked on the street & in the shop parking lot. WOW! this was not Cleveland, Ohio for sure! 1957 Pontiac with a wild outline / panel paint-job was parked on the street in front of the shop. On the right on the curb we can see Dean Jeffries Porsche, and in the front, also parked on the curb is the Kopper Kart. Parked next to that is George Barris personal candy red with a silver top 1958 Cadillac Coupe DeVille. They parked the car and got out to take a look at the cars parked in front of the shop and slowly worked their way inside the shop. Gary and his friends were able to talk with a lot of the workers at the shop, picking their brain for styling advise for Gary’s 59′ Thunderbird. Gary didn’t know anyone at the shop, but he is sure all those guys he talked to are all famous now. Inside the shop they were working several cars including Shirley Barris’ 58′ Thunderbird. They spend quite a bit of time at the shop, absorbing everything they saw and everythign that was going on. But the time they were at the shop they did not see George Barris himself. George must have been outside the shop, perhaps shooting photos on location, or some other publicity work. But the guys did see a lot of cars with the Barris Crests, & that was enough for them. Gary took 24 snapshots of the cars and the Barris shop, but sadly he has misplaced most of them. A few years ago he did come across 8 of them while searching for something else. Those 8 are now in this article and who knows those missing 16 photos will turn up one day… and if they do, we will be sure to share them here with you on the Custom Car Chronicle. A view at the work place shows that the Barris Shop was working on Bob Crespo’s 1940 Ford “Les Popo”, that had previously been sectioned and restyled by Hal Hutchings and Bill Cushenbery. The Barris shop had done the quad headlights, grille and hood scoop and had just been coated in a fresh coat of black primer. Next to it is Jim Seaton’s 1959 El-Camino, and all the way in the back is Lyle Lake’s 1952 Buick the “Blue Danube” in for an update. 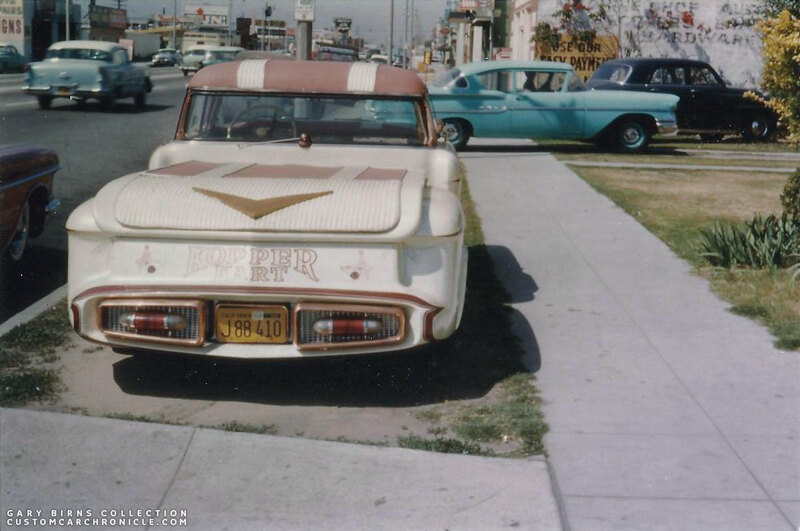 Another view from the street shows the Kopper Kart on the curb and George Barris his personal 1958 Cadillac Coupe de Ville. The car looked stunning in brilliant candy red, silver top, white interior, Button grille and spotlights. Peaking out behind the kopper kart are the double headlights of Dean Jeffries silver Porsche. The Barris shop is not really very big, so work on the cars was done everywhere. And in SoCal the weather is really good most of the time, so the parking space outside the shop was just one big work place. Gary had this photo signed by George Barris at a show he attended many years after he had taken the photo. This is a really great photo with all the cars on the street in the background and of course the kopper Kart in the for ground. It was amazing to be able to walk around that car and see everything in daylights and so close by in person. This 1952 Chevy Hard-Top parked on the street was very nice as well. Beautiful color and paint, with an all white tuck & roll interior with dark green piping. Notice that the rear view mirror and the horn ring are covered in hand made two tone furry covers. It was common back then to have your girlfriend make these dress-up parts for your car. Close up of Jim Seaton’s 1959 Chevy El Camino. Molded headlights, bullet grille on expanded metal, and reshaped eye brows. 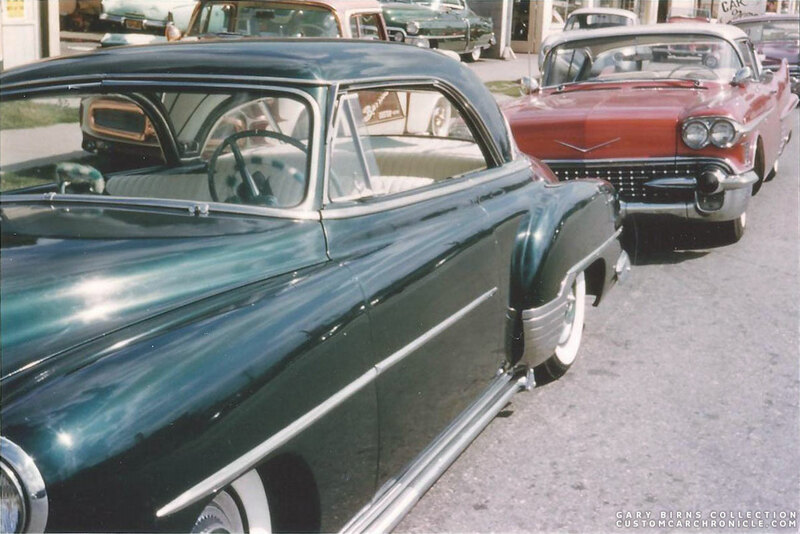 The car was painted to match Jim’s 1955 Chevy. 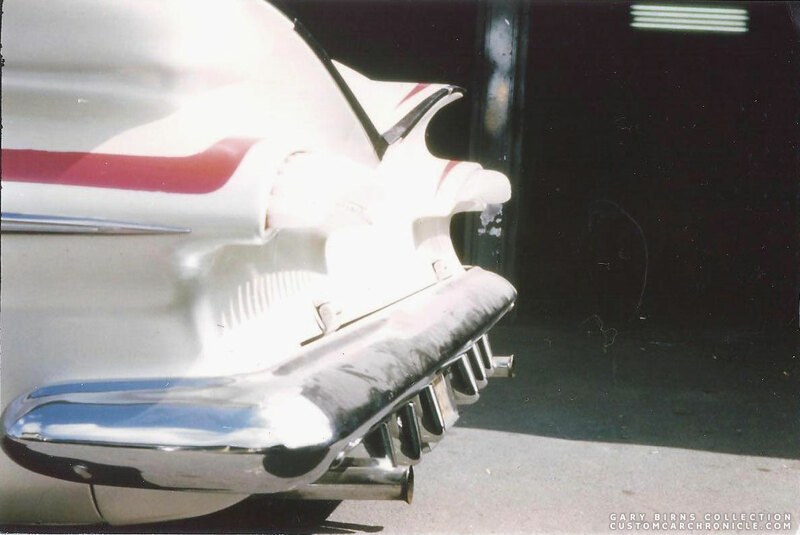 Sadly a bit overexposed, but this photo shows the unique taillights the shop created on Jim Seaton’s 1959 Chevy El Camino. The light were done in red plastic to which vertical mounted white plastic shaped ribs were added. While the guys were in Los Angeles they stayed in several motels and had some addresses they wanted to see. But each day they where they would stop by at the Barris Kustoms Shop to see what was new that day. The shop was just intense with so many projects going on at the same time. They also visited Larry Watson’s shop, Ed Roth Studios, & Bill Cushenbery‘s Custom shop in Monterey, CA. Sadly they only brought one camera with them, which broke down during the trip. And they were very low on budget due to the fact everything in LA was so much more expensive than down in Ohio. They just could not afford to buy a new camera. Now thinking back they of course all wished they had spend the extra money and did buy a new camera back then. 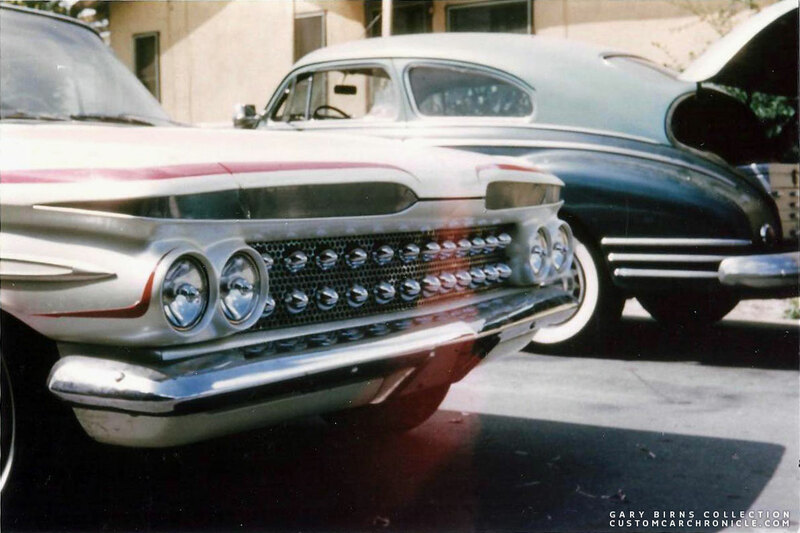 This is one photo Gary found of another Barris Kustoms created Custom, the Aztec. This photo was actually not taken at the Barris Shop in 1960, but rather at a late 1950’s Cleveland Ohio show. 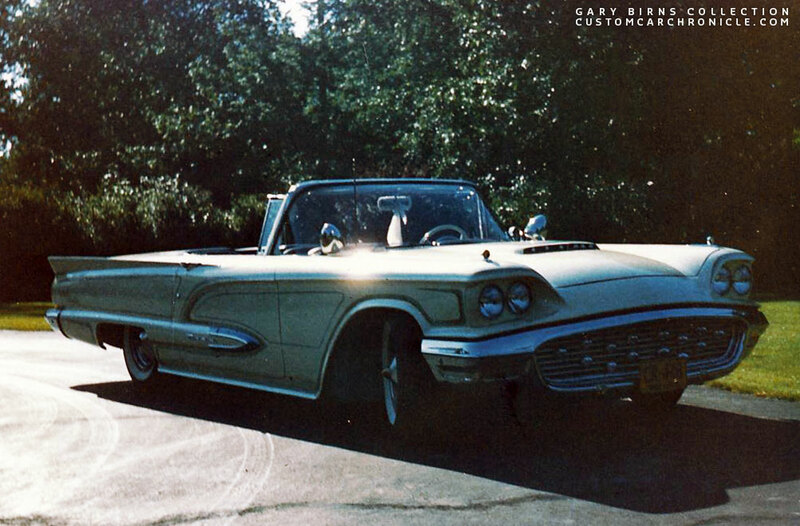 This photo was taken in May of 1960 when Gary’s 1959 T-bird was a “Mild Kustom”. This version of the car was scalloped and striped by Gary’s friend Arni Nashbar. 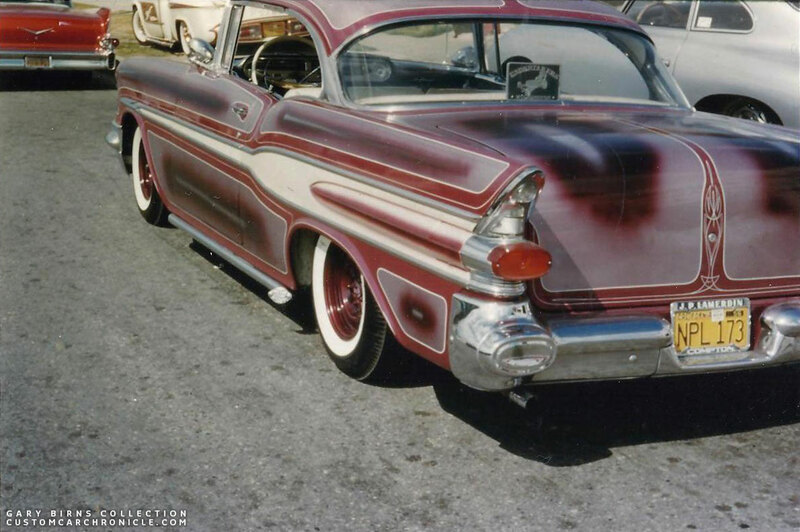 After Garry had returned from his Barris Shop visit he took the car to Davis Auto Body & Kustom where it would be turned into a “Semi Kustom”, with Candy Apple paint, reshaped rear fins, and molded in lake pipes. But we will tell you more about that in a future CCC-Article. On the way back home they wanted to stop at the Star Kustom shop to see Darryl Starbird, but they got lost & were in a hurry to get home. They took a detour on the drive back & stopped in Detroit to see the Alexander Brother‘s Kustom shop. Their shop was really great as well, they were building some really cool cars. I especially liked a Candy Apple Red 1958 Chevy Impala Hardtop that they were just finishing (Gary mentioned that is was a really great car, but he never saw it in any magazines). They were using a lot of white plastic & clear plastic rods on their cars. Gary was rally impress and inspired by that. It did gave him some good ideas for the taillights for on his own 1959 Tbird. 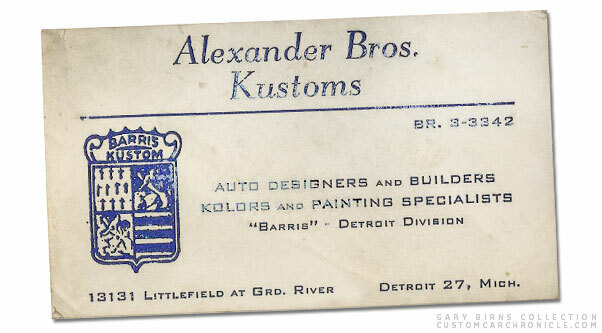 The Alexander brothers gave me one of their Alexander Bros Kustoms, Barris Detroit Division business cards. With all the inspiration gathered from the road-trip in the summer of 1960, Gary had the the boys at Davis’ Auto Body in Cleveland Ohio restyle his 1959 T-Bird to his design. The car was finished in a beautiful candy red paint. cars driving by is just sooo awesome…! I do hope others come forward with shoots and photos never before seen…..!! I love the articles like this because there just so great to read and see the photos first hand. Thank you Gary Birns for sharing your photos and thank you Rik for the awesome articles….. It was my pleasure to share my photos. ROAD TRIP! What a great story – and with pics! That’s just cool!